Investigating a GR is always a pleasure for adventure lovers. However, what if we add the smell of the sea? The GR221 has a total of 132 km and once studied it is clear that it is not just a mountain route. Traditions, architecture, customs, legends, crafts, and adventures are crossed in an island full of magic. From Esporles to Deiá – Its positive slope of 1120 m and 1170 m negative is classified as medium – high difficulty by the unevenness to overcome. Its forests of holm oaks, the old carboneras, cisterns and the stop in the beautiful Valldemossa recreate the senses. The refuge of Deiá is very welcoming, or will it be that the enclave is a fairy tale? From Deiá to the Crutch refuge, the slope is 220 m in positive and 270 m in negative, although it seems very simple, its difficulty is medium. You can go down to the sea from Deiá before restarting the mountain route, truth be told, it’s worth it. Before beginning the descent, I recommend tasting at Son Micó, old manor house from 1962 surrounded by forest and overlooking the sea, its natural orange juices and a homemade dessert that leaves you feeling like a new person. The refuge Crutch is the only one who sleeps with the sea at its feet and really comforts the spirit. 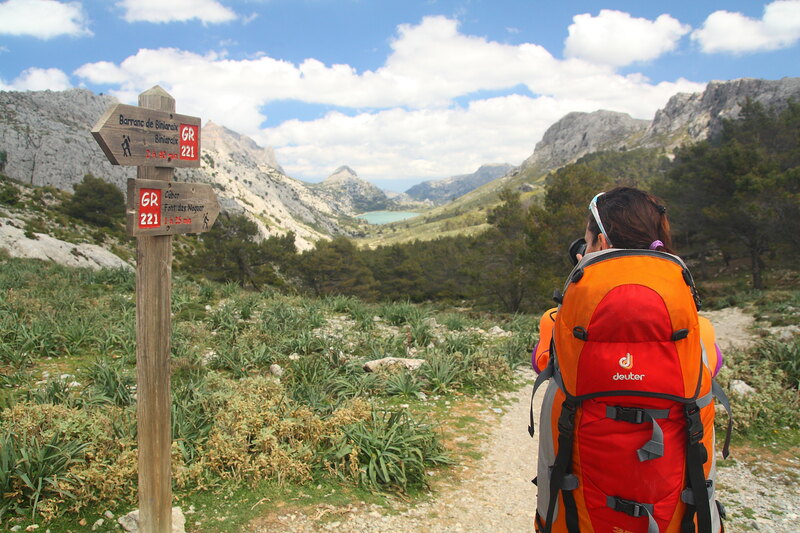 Walking towards the shelter of Tossals Verds implies 970 m in positive, 550 m in negative and a big amount of adventures. Visit the port of Soller, take a 100-year old train to reach the town of Soller, enjoy the Pla de Cúber and Gorg Blau lakes, see the sea glow from the mountains and reach the shelter for warm dinner are some of the exploits. We could call it the Star Stage for its variety of scenery and beauty, but it’s hard to define which Stage is the best. It has 830 m in positive and 800 m in negative with a medium – high difficulty. The descent to El Santuario de Lluc is of singular beauty and enjoys a spectacular enclave. We recommend a visit to learn its history full of legends. In half an hour you reach the shelter of Son Amer. It has a beautiful view over the valley, the treatment is exquisite and has an excellent infrastructure. It finishes smoothly, with 250 m in positive and 700 m in negative. As always, the green forests refresh us with their shadows and delight with their scents. The descent is smooth and comfortable, although the last kilometers in plain could be avoided. Pollença is beautiful. It deserves a day of rest to visit her quietly. Moreover, what a variety of flavors for the palate! Who has dared to say that Mallorca is just beach?